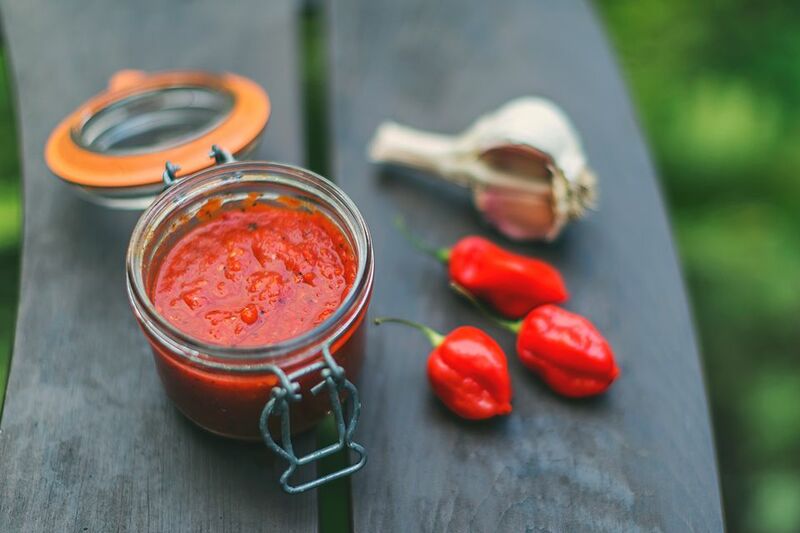 Chili sauce is a condiment that adds spice and flavor to anything from Asian recipes to Western favorites. It can be used as a wonderful dip for finger foods of all kinds or a side condiment to add more spice to your food just as you might add salt and pepper. Or you can use it as a handy cooking ingredient—a good substitution for fresh chili. In most Asian countries as well as in Mexico and Central America, no table setting is complete without a bottle or jar of spicy chili sauce. Depending on what kind of chili sauce you buy or decide to make, the ingredients vary but not widely. Mexican chili sauce is usually made with Mexican hot chilies (often they are dried first), red or green, which are simmered in a base of vinegar and sometimes tomato. Louisiana sauce is made of aged red or green chilies simmered with vinegar and salt or sugar. Asian chili sauces are usually made with Asian hot red chilies; Thai bird's eye chilies are popular. Usually, the chilies are roasted first, then blended to form a paste that is then simmered with fried shallots and garlic, shrimp paste, sugar, and fish sauce or soy sauce. The oil-based chili pastes are made in a similar way, but with soybean, palm, or other oils added. In North America, there are various types of chili sauce available for your eating pleasure, including the most famous ones: Mexican, Tabasco Sauce, and Louisiana Hot Sauce. There are numerous types of Asian chili sauces, including oil-based chili paste, chili-garlic sauce, classic Thai Sriracha chili sauce (now available at most grocery stores in North America) and the famous Thai Nam Prik Pao chili sauce. You might like to try Indonesian Sambal Oelek. It comes in a plastic jar and you can often find it in the Asian section of grocery stores. Thai cuisine also has a wonderful sweet chili sauce, which makes an excellent dip for spring rolls, egg rolls, chicken wings, and other finger foods. You don't have to do anything to this sauce to serve it—just pour out and start dipping. This chili sauce also works well as a side sauce for roasted or fried chicken and makes a fabulous marinade as well as a dip. Generally speaking, if a recipe calls for fresh minced red chilies and you don't have any in the house, substitute a teaspoon of Thai chili sauce in place of one red chili. These chili sauces can also be made into spicy stir-fry sauces. Experiment by adding soy sauce or fish sauce, a little sugar, and some chicken or vegetable stock; otherwise, it will be too spicy.